Google Photos is certainly a cool service — automatically syncing your photos to the cloud, so you could instantly access them from any device, allowing you to do some quick touch-ups, and organizing your photos by life events, location, and actual pictured content. It’s definitely a must-have on any Android user’s phone, even if you have subscribed to competing services — Google will allow you to upload an unlimited amount of photos to its servers so long as they are under the 16 MP resolution threshold. There is, however, a slight annoyance that goes hand in hand with the luxury of having all your pictures automatically backed up, and that’s the fact that you can often find screenshots, images that have been sent to you via a messenger, or pictures that you have downloaded from the Web backed up to your Google Photos. The remedy for this is to pick which of the device folders you want to be uploaded to the cloud, but that’s not a perfect fix. For example, if someone sends you a few photos from last night’s party, you will either have to temporarily enable backup for your device’s Download folder, or you will have to manually move the photos to your Camera folder, if you want them to go straight to your Google Photos account. Well, with the most recent update issued by Google, you will be able to select and manually backup any photo from any device folder. Just open Photos, go to the album that contains the desired images, select them, press the triple-dot menu on the top right, and choose “Back up now”. This is a small, but definitely a very useful new feature! Currently only available on the Android version of Photos, but should hit iOS, too. 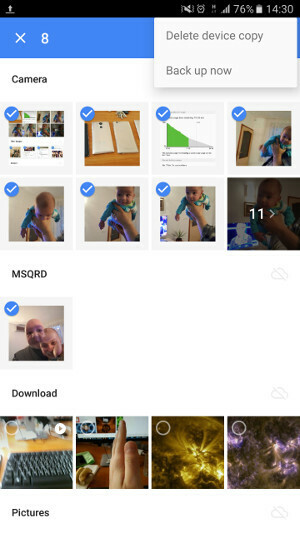 Google Photos>sd card as far as I'm concerned. We put sd cards in every device here at work and they just fail entirely too often for me to trust them. And when I say every device I support 1308 lines, so not like 50 or something. THIS! I downloaded google photos like 2 weeks ago when a friend lost his device full of photos, I was like better to have them backed up, and after like 4 days, my sd card died suddenly lol. Would have lost lots of photos (I back them up locally but not really too often). Where can I see the option of sharing this auto upload folder?. Ex.. i want to share this folder with my wife always...whenever i take any photo my wife has te ability to see them when upload happens..